As a part of our celebration of all things beads - and definitely all things glass - I'll be giving away a copy of this terrific book published by Interweave Press. Although I think that the book is best suited for beginners, it has some really fun designs in it that intermediate and advanced beaders will enjoy too. You can read my review of the book here. That looks like a very interesting book, i've been doing seed bead work for a while and have recently stepped into the realm of glass jewelry with aplomb I think I may have to invest if I do not win this. I mostly work with glass beads when doing stringing projects and with my earrings too. Lately I've been neglecting my stringing while learning the bead weaving stitches but will never give it up completely. I still love it and have lots of customers that do too, but I do love doing right angle weave, triangle weave & netting projects!! I guess you could just say I'm addicted to beads and beading!! Accent beads and pendants - I can't get enough of 'em and every piece I do starts with them. The rest sort of happens naturally. the bright colors and I like interesting beads, big beads that are unique. I like to use charms. When I bead, whether it's a necklace, bracelet, or other item, many times I'll add a charm on the clasp. Especially with a necklace, most don't see the charm, but the message (i.e. happiness, love, peace, etc.) is there for the person for whom I've made gift. Working with natural stones makes me the happiest...occasionally I do venture into glass and I do have some great glass beads in my collection. I do bead crochet with seed beads and now I am learning to do my own lampworking. The bug has bit hard. Thanks for the chance to win this book! I create my jewelry with wire and jump rings, interspersed with beads of all types and varieties. A lot of my pieces are based on chain mail weaves. For stringing (items I make to sell, I love to work with clean, clear semi-precious stone. I can not always afford them, but I do watch the sales. For myself I love to combine the gems with Pat Doyl's lamp work beads. 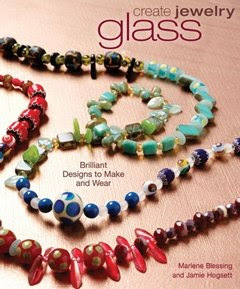 This book would give me an incite into creating my own glass beads...that would be cool! Susan Spiers - I'm new to stringing beads, but I have used a light-weight fishing line. That book looks great! I wish we even had a place to peruse books like that near me. I do weaving and knitting with beads right now but soon I am taking a lampworking class. I am sooo excited to make my own beads! Thanks for creating such a fun and interesting site! freeform faceted stone nuggets and faceted rondelles are my favorite materials to string, although its hard to choose favorites. Would love to win the book! I use glass beads, I wish I could use other kinds but they are the only type not to cause a reaction! This book looks scrumptious! Thanks for the chance. I like Softflex flexible beading wire the best. I am hard on my jewelry and so far it has stood up well to all the abuse. Hey Cyndi! At the moment, I'm hooked on wire crochet and love using all sorts of little beads, seed beads, gemstone chips, bugle beads to create beautiful chokers and bracelets. I do string beads and make eye glass chains. There I like lots of color, textures and all sorts of different beads. I'd love to win this book. I'm always game for new inspiration. Im always on the hunt for more inspiration - looks like this book has lots of interesting design ideas! I work with seed beads and glass beads to make jewellery. Recently I have started to use beads for embroidery and this book will be a great addition to my learning. I just found your site! super cool, and I love the giveaways! I work mostly with glass and stone, string necklaces and bracelets on Beadalon. What I particularly look for to work with are unusual bead caps and spacers. The glass and stone are the "meat" of the project, while the caps and spacers add the "spice". Hi! I use lampwork beads, sterling and Swarovski crystals. I am now playing with copper. I use seed beads for many things, earrings, rings, bracelets and have also done some weaving. There is so much more I want to learn. I also think I will have to invest in it if I don't win. Cool giveaway! I spend more time making glass lampwork beads then I do stringing them up nowadays, but I generally prefer softflex for stringing projects. I like stringing glass beads and pendants. I love copper and silver findings. Natural gems are nice too. Love this contest!I love pendants and glass beads. copper and silver findings are my favorite. Stringing...wire, is my absolute favorite! But I do use any number of products such as leather, tiger tail, and fishing line, when called for. I have not done any stringing projects, but after looking at pictures of glass jewelry I think I would like to try it. I am not currently doing any crafts, but hope to start back some time soon. I love to mix all kinds of beads and charms, and my favorite stringing material is softflex. I am intrigued by making resin items; may start making some resin pendants soon.